I’ll just share you a story. Last week, we had a visitor from Detroit, Michigan. He’s always bragging that the Philippines has the best beer in the world. He was advised by his son to try San Miguel Beer and San Mig Light while he’s here in the Philippines. So, he tried it… I asked him, “what do you think of our beer?” He just answered, “THE BEST BEER I EVER HAD. The Philippine version of San Miguel is much better than the Mexican version.” He described it as “a pale golden lager with pleasant, clean finish with well-balanced medium body, lively and snappy with a distinct bitter hop character that slides smoothly on the palate.” I’m not into beer, but hearing those words made me thirsty. San Miguel Beer Division (SMBD) a division of San Miguel Corporation, the largest food and beverage company in Southeast Asia. 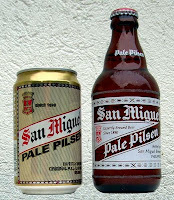 SMBD manufactures and distributes San Miguel Pale Pilsen, the undisputed leader in the Philippine market and the leading beer in Hong Kong. San Miguel also produces a wide range of popular beverage products that are runaway market leaders in their respective product categories. San Miguel Pale Pilsen is the Company’s flagship brand and the Philippines’ leading brew. It is one of the world’s largest selling beers. Made from imported barley malt, as well as German and American hops, it is exported to over 40 countries worldwide. * San Miguel Pale Pilsen is featured in the anime feature Ghost in the Shell. The movie has scenes wherein Batou (one of the main characters) drinks a can of San Miguel Beer, which was recreated onscreen faithfully to its real life appearance. * During the Japanese era, and Andres Soriano was in America with the exiled Commowealth Government, San Miguel became the Balintawak Beer Brewery, Funded and supported by the Japanese until the liberation. Andres Soriano ordered the beer to be consumed by the Americans and the Filipinos to the last drop rather than be labeled under the name San Miguel. * People in Hong Kong often assume San Miguel Pale Pilsen is brewed locally (although it does have a brewery factory there). * San Miguel in Spain has the same origins as San Miguel in the Philippines. However, since 1953 the brewery in Spain has been under separate ownership and no longer has any connections with San Miguel Corp. Philippines. The beer in Spain is brewed by San Miguel Fábricas de Cerveza y Malta S.A., part of the San Miguel-Mahou group. * In the movie Shaolin Soccer, Fung is drinking a can of San Miguel Beer when he meets Steel Leg for the first time. * Latest commercial endorsers of San Miguel Beer include Kris Aquino, Manny Pacquiao, Erik Morales, and Jet Li. * In the Philippines, Hong Kong, and Korea ‘white label’ San Miguel is available. However in other areas, only the ‘gold label’ is available. Gold label is a gold colored paper label, while white label is painted on white lettering. SMC has started shipping the gold paper labeled bottles, at least in Manila and is rumored to be phasing out the white versions. * San Miguel Beer Division held a 3-day drinking contest in Makati, Philippines. The winner of this 1994 drinking bout is no other than 20 year old Carlo Decena Bilbao, who still holds the record of 83 bottles of pale pilsen. Take note, this was all consumed without the use of his hands. He would simply pick up the bottle with his mouth and start pounding one after the other. The second placer for this event was no other than the German Gulper himself, Roland Hiitzer, who downed 15 pilsens.